The current hypothesis of relationships for pierid genera is based upon the molecular phylogenetic hypothesis of Braby et al. 2006. Taxa not included in that hypothesis are indicated as incertae sedis as indicated by the authors, and the inferred positions of several fossil pierid genera are also indicated. Pieridae are the sulphurs and whites, medium-sized mostly pale-colored butterflies with a world-wide distribution. There are some 1100 species. 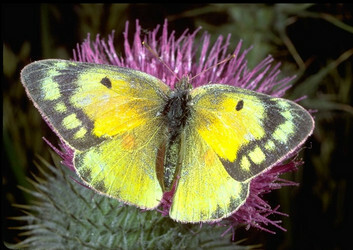 The name Pieridae is attributed to Duponchel, 1835, in the Official List of Family Names, but J. Pelham (pers. comm.) points out that Swainson employed the name for a family-level group some 15 years prior, and argues that priority should be observed. Bridges, C. A. 1988. Catalogue of Papilionidae and Pieridae (Lepidoptera: Rhopalocera). Urbana, Illinois: Charles A. Bridges. Lamas, G. 2004. Pieridae. In: Lamas G, ed. Checklist: Part 4a Hesperioidea–Papilionoidea. In: Heppner JB, ed. Atlas of Neotropical Lepidoptera, Vol. 5A. Gainesville: Association for Tropical Lepidoptera/Scientific Publishers, 99–117. Pollock, D. D., W. B. Watt, V. K. Rashbrook, and E. V. Iyengar. 1998. Molecular phylogeny for Colias butterflies and their relatives (Lepidoptera: Pieridae). Annals of the Entomological Society of America 91(5):524-531. Stavenga, D. G., S. Stowe, K. Siebke, J. Zeil, and K. Arikawa. 2004. Butterfly wing colours: scale beads make white pierid wings brighter. Proceedings of the Royal Society of London B 271:1577–1584. Page: Tree of Life Pieridae Swainson 1820. Authored by Andrew V. Z. Brower. The TEXT of this page is licensed under the Creative Commons Attribution License - Version 3.0. Note that images and other media featured on this page are each governed by their own license, and they may or may not be available for reuse. Click on an image or a media link to access the media data window, which provides the relevant licensing information. For the general terms and conditions of ToL material reuse and redistribution, please see the Tree of Life Copyright Policies.